Also, I have just finished version 1 of my Drupal SEO Friend Module. 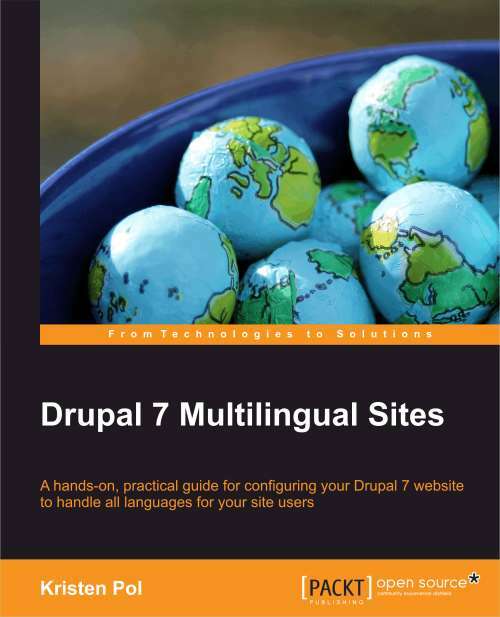 It has been accepted at drupal.org and is available at: https://www.drupal.org/project/seo_friend. Download the tar file, untar it into your sites/all/modules directory (or wherever you are keeping your 3rd party modules), enable it at admin/build/modules, and then check out the settings page at /admin/content/seo_friend and reports at /admin/reports/seo. Although I have tested this locally, please try it first on a development version of your site rather than the live site. It does not modify your content and mostly contains error checking and reports, but this is good practice in general when you are installing new modules. For a current feature list, please see the Drupal SEO Friend project page. 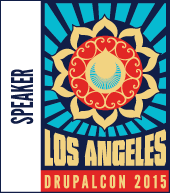 The features do not duplicate and do not compete with any existing Drupal modules. The SEO Friend module is meant to be used along side the existing Drupal SEO modules to make them more effective. 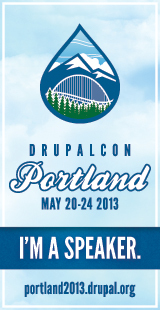 That will help increase Drupal SEO friendliness. I do intend to add new features in the future. If there are additional features that you would like to see in the SEO Friend module, please feel free to contact me. Also, if you find any bugs, please let me know right away and I will make sure they are fixed asap. Are you wondering why I named the module "SEO Friend"? I thought it was a nice play on words since the goal of the module is to help you make your Drupal site more SEO friendly. ya i believe.. Drupal is SEO friendly.. Drupal component with the help of a few modules, makes it easy for you to do the things that tend to result in a higher rate of search engine success. 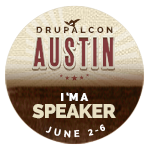 In other words, Drupal makes it easy to practice good SEO. First I want to thank you for developing this module. It really helps a SEO novice like me, WOW there are a lot of modules to add. The first thing I want to mention is about your module is I'm receiving the following error when I click on the "Meta Tags (node) Report"
The next thing is I have two questions. 1. I have "Global Redirect" loaded, but your model says I should also load "path_redirect" however, there is a critical compatibility issues with that module and the Global Redirect 6.12. Is there a way to check for duplicate paths? 2. Do you know how much of this SEO stuff will be added to the core of the new Drupal 7 version? Glad you are checking out the SEO Friend module... hope it helps you. Note that although all those SEO-related modules are listed, there are only a few that are "must haves". 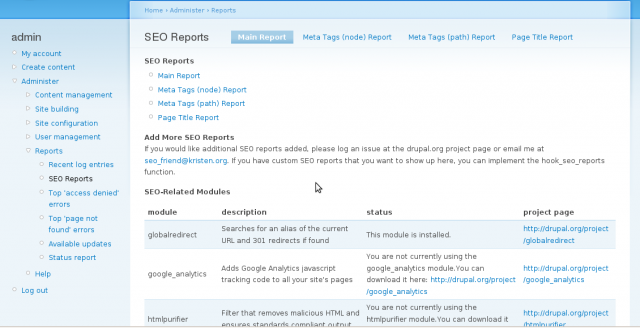 Here's a list with some notes on these Drupal SEO modules. I'm sorry you are unable to use Global Redirect along with Path Redirect. I'm surprised they are now incompatible... bad news. Perhaps using an older version of Global Redirect would be the best move there so you can use both. As for Drupal 7, I don't believe any of the listed SEO-related modules will be in "core" but all the important ones should be ported at some point. That is currently on my to-do list for my contributed modules. Btw, I'm also trying to spread the word about my Featured Content module that lets you easily create many different kinds of featured/related content blocks. I recently added that to the SEO modules list in the SEO friend module. Thanks for the reply. I think I have most of this set up, but the "nodewords" or meta data module has a lot of settings and the documentation for it is not very clear. I'm in the process of going back through my entire site and updating the meta data on each node, but it is all the different entries under the default and specific meta tags that are confusing. For example, under the Front Page, the block for entering your Canonical URL. It says to use a relative URL, but that does not make sense since this URL would be the home page or bobsdailyblog.com. Oh, well things are moving along I think since the number of visitors is being to increase and my Google webmaster tools are not showing any problems yet. Hi Kristen, just downloaded the SEO friend and will install shortly. Can you tell me wheter h1, h2 etc in the body of a post still matters for search engines? My formatting with WYSIWYG and TinyMCE is so crap that I can't really use headers and just do different font sizes instead. Yes, h1/h2 are still very important. Depending on your theme, the node title should be in an h1 tag for node view pages and h2 tag for summary pages. Some themes put the node title in an h2 tag (and site info in h1) but this is not the best way. It would be good to use h2 in the body of your text if you can figure out how to do that with your wysiwyg editor. I personally don't use wysiwyg editors since I like to have a better idea what is happening in the text/html.